After Consumer Preview Windows 8 & Windows 8 Developer Preview now Microsoft just announced final pre-release version of Windows 8 named Windows 8 Release Preview. Windows 8 is considered to be the biggest change in decades to Microsoft's widely used operating system. 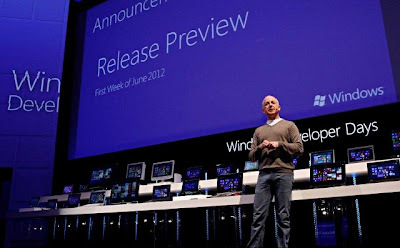 In a blog post, Steven Sinofsky, Microsoft's top Windows executive, touted the Release Preview as the "final pre-release" build, and talked about the next milestone, RTM, for "release to manufacturing," the label that describes the completed version used by computer makers to pre-install the operating system on new PCs. Microsoft also says that it has increased personalization options for the Start screen and refined the way “the way people find and download apps through the Windows Store.” The touch-friendly Metro version of Internet Explorer now also supports Adobe’s Flash player and features a Do Not Track feature that is turned on by default.